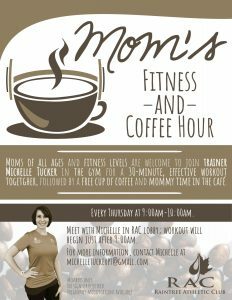 Moms of all ages and fitness levels are welcome to join trainer Michelle Tucker in the gym for a free 30-minute group workout, followed by a free cup of coffee and mommy time in the RAC Café. Members only. No registration required. Pregnancy modifications will be available. For more information contact Michelle at MichelleTuckerPT@gmail.com.